Keeping track of your documents and presenting them in a easy-to-access manner is a frequent request for association websites. Our File Archive feature makes it easy to upload, categorize, and caption documents. 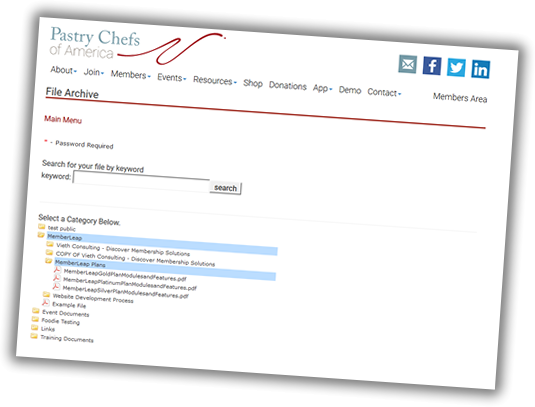 Private or Public - You can present lists of documents on the public side of a website, keep them available only to members, or limit access to members of a particular membership plan or committee. Search - allow for sophisticated searches through document title, description, or the content of the document itself. Metadata / Additional Fields - while keeping track of your documents, you can tag each document with author, date, and other additional pieces of information. Mass Upload - upload large numbers of files at the same time, with ease.